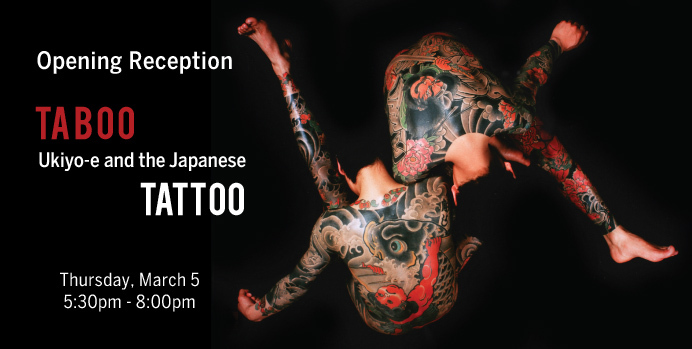 Opening Reception – Thursday, March 5 from 5:30 p.m. until 8:00 p.m.
Japanese Whisky Tasting at Asia Week Reception – Friday, March 13 from 5:00 p.m. until 7:00 p.m.
Tattoos are complicated cultural symbols, simultaneously representing both belonging and non-conformity. Appearing in countless cultures across the globe, tattoo is an indelible form of human expression. While a tattoo may signal membership to a group or subculture, it may also define its owner as outside mainstream society. In Japan, the art of tattooing, or irezumi, burgeoned during the Edo period. As the world of ukiyo-e flourished, irezumi and printmaking became deeply referential, sharing themes and styles on paper and skin. This rich tradition continues today, engaging photography and mixed media into the age-old artistic dialogue. Ronin Gallery’s exhibition Taboo: Ukiyo-e & The Japanese Tattoo Tradition celebrates the enduring conversation between ukiyo-e and irezumi. The work of print masters Kuniyoshi, Yoshitoshi, and Kunichika explores the world of tattoo during the Edo and Meiji periods, while the original paintings and drawings of the acclaimed master of tebori (hand tattooing) and tattoo art, Horiyoshi III, offer a current interpretation of this centuries-old tradition. The contemporary art photography of Masato Sudo continues the conversation while the mixed-media work of American artist Daniel Kelly speaks to the universally inspirational power of the Japanese tattoo. Today, tattoos are less a taboo performance of otherness and increasingly an appreciated form of artistic expression. As the Japanese art of irezumi persists, adopting new forms in today’s culture, this exhibition considers the marriage of tradition and innovation through both the lens of ukiyo-e and contemporary art. For more information, please visit Ronin Gallery’s website.